12/15/2018 20:00 12/15/2018 America/New York A Carpenters Christmas While The Carpenters are known for over a dozen chart topping hits, they also won over their fans with their Christmas celebrations. 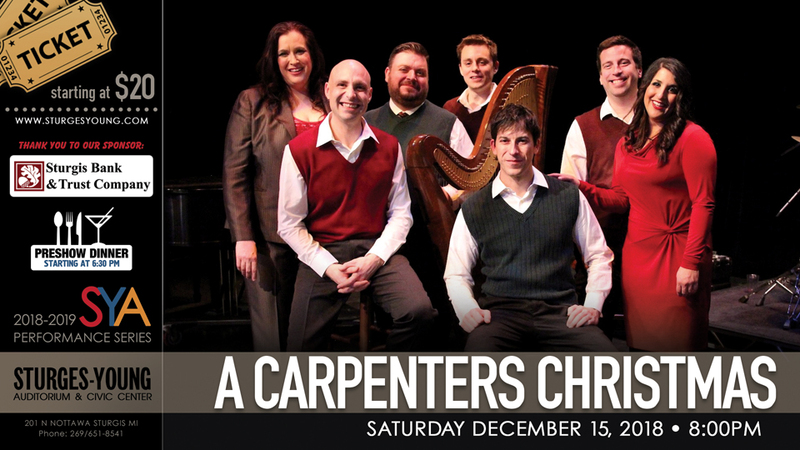 Singer and playwright Lisa Rock and her 6-piece backing band are keeping The Carpenters' holiday traditions alive and bringing their unforgettable Christmas songs to the stage. Based on the music of The Carpenters’ two holiday albums and Christmas variety shows, A Carpenters Christmas and featuring "Merry Christmas Darling" and the jazzy "Santa Claus is Comin' to Town," it's a holiday concert that spreads joy and cheer to all. Sturges-Young Auditorium: While The Carpenters are known for over a dozen chart topping hits, they also won over their fans with their Christmas celebrations. Singer and playwright Lisa Rock and her 6-piece backing band are keeping The Carpenters' holiday traditions alive and bringing their unforgettable Christmas songs to the stage. Based on the music of The Carpenters’ two holiday albums and Christmas variety shows, A Carpenters Christmas and featuring "Merry Christmas Darling" and the jazzy "Santa Claus is Comin' to Town," it's a holiday concert that spreads joy and cheer to all. Singer and playwright Lisa Rock and her 6-piece band are keeping The Carpenters' holiday traditions alive with spot-on renditions of their unforgettable Christmas tunes. While The Carpenters are known for over a dozen chart topping hits, they also won over their fans with their Christmas celebrations. Singer and playwright Lisa Rock and her 6-piece backing band are keeping The Carpenters' holiday traditions alive and bringing their unforgettable Christmas songs to the stage. Based on the music of The Carpenters’ two holiday albums and Christmas variety shows, A Carpenters Christmas and featuring "Merry Christmas Darling" and the jazzy "Santa Claus is Comin' to Town," it's a holiday concert that spreads joy and cheer to all.